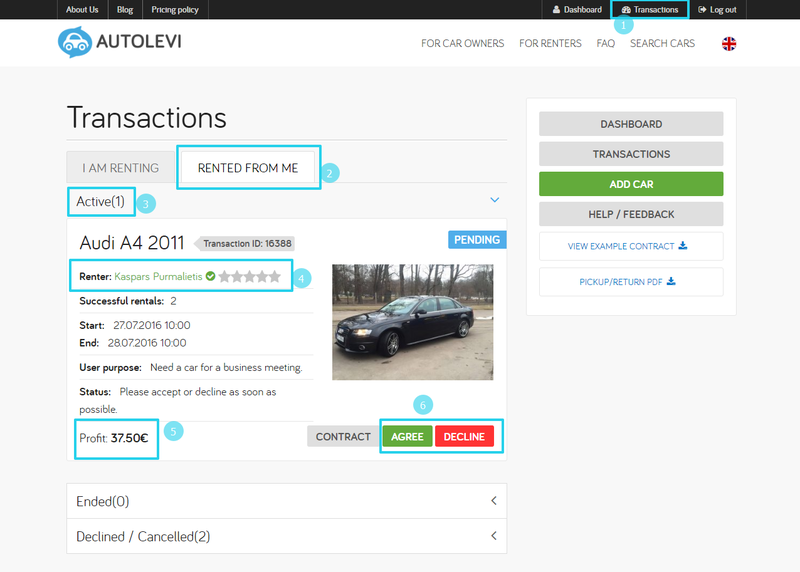 In this post we will explain how to list your car on Autolevi and start earning money. If you’re not a registered user, first read the short brief how Autolevi works, check the information for car owners and sign up your car! How does the rental of my car happen? If someone will book your car, you will receive an e-mail and/or a text message (you can select the message type in your profile). Go to section “Transactions” and check active rentals. Check if the user has passed background check! We advise you to only accept rentals from checked users (they will appear green on the website). Read more about user background checks on our blog. Check the beginning and end dates and times and accept or decline the reservation! If you accept the reservation, we will inform the renter via e-mail and/or text message that the rental has been accepted. As soon as the renter has paid for the rental, you will receive an e-mail and/or a text message. Until that, other users will be able to book your car. An agreement will be automatically eletronically signed once the rental has been paid. If you have several reservations for one date, please cancel the other reservations once a payment has been made by one of the renters. Contact the renter and discuss the delivery of the car. Print out the delivery and acceptance statement and prepare the car for rental. Meet the renter and deliver the car. After the rental, meet the renter to pick up the car. Check if the car is in the same condition as before: the car is clean and tidy, the fuel level is the same (if it isn’t, make an agreement with the renter that he will pay for it in cash or fill the tank) etc. Check the car with the renter and sign the delivery and acceptance statement again. Rate the renter after the rent and leave a short feedback so that it would be easier (or harder) for the renter to rent a car the next time. We will also ask the renter to rate the car owner and the car. At the beginning of each month we will make a payment about all the rentals of the previous month. This way we ensure a smoother service in case the rent has been cancelled or there have been other issues, since we can take care of it in your place. If you have any problems or something is not clear, you can get in touch with the Autolevi team by sending an e-mail to info@autolevi.ee or calling +372 539 555 49. We use the information provided in your profile, so, if you want to receive payment to another bank account, get in touch with you on another e-mail or phone number, please, update the information on your profile. You will receive 75% of the rental price. We will use the remaining 25% to advertise your car, carry out user background checks, make the platform more convenient and safer, as well as create new services. Right now we are working on a new short-term KASKO insurance for the rental period, car monitoring and tracking and other services. Don’t forget that you can advertise your car yourself! The more people know that you are renting our your car, the more rentals you will get and the more money you will receive! Tell about this opportunity on your social media, send e-mails to people who might interested and tell your friends about it. Your friends will most likely be happy to rent the car from you and you will most definitely feel better knowing that your car is used by someone you know. We will appreciate you telling us what you like, what you don’t like and what you would like to see improved! 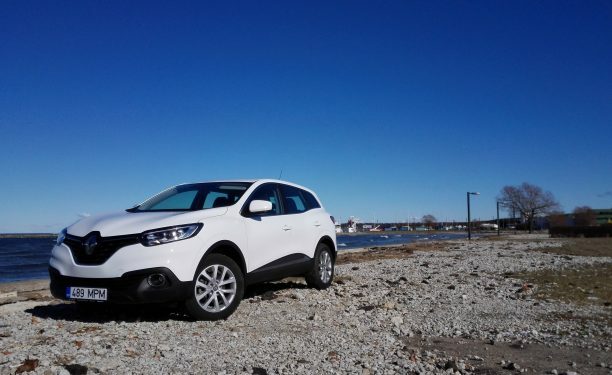 You can contact us by writing an e-mail to info@autolevi.ee or calling +372 539 555 49. Most questions have been already answered in the FAQ, so make sure to check it! If you can’t find the answer to your question there, it might be in our blog, since we post more detailed articles about a variety of topics there. If the answer’s not on the blog as well, just get in touch with us! We hope that this information will be useful! If there are any more questions, feel free to get in touch with us!